that your organization’s private apps would move from the “Private Channel” (i.e. the “domain.com” tab) to the “Work Apps” tab in the Google Play Store. We envision this Work Apps section as a single destination where users can find all of the applications they need to be productive on mobile. Using Google Mobile Management, G Suite administrators can offer a curated set of both public and custom apps to their employees in the Work Apps section of Google Play. 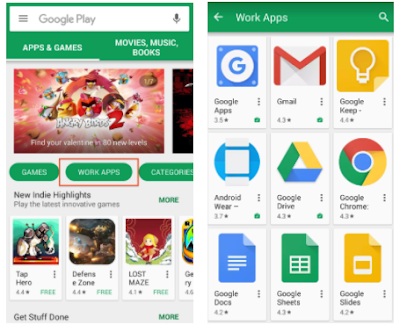 Previously, however, employees with Android devices that did not support work profiles could not see the Work Apps tab and the apps their admins had curated. This included any users with Android devices running 5.0 Lollipop or less. With this launch, employees with these older devices can now access the Work Apps tab in Google Play (in their personal profile) and the apps their admins have curated. Note that on devices that do support work profiles, the Work Apps tab can only be accessed from Google Play in the work profile. Recently, we announced that your organization’s private apps would move from the “Private Channel” (i.e. the “domain.com” tab) to the “Work Apps” tab in the Google Play Store. We envision this Work Apps section as a single destination where users can find all of the applications they need to be productive on mobile. Using Google Mobile Management, G Suite administrators can offer a curated set of both public and custom apps to their employees in the Work Apps section of Google Play.